We have lots of great teen party ideas for you! Our collection of teen party theme ideas will help you plan something great that will be cool, fun (and easy!). We have lots of great party theme ideas for you! The teenage years provide lots of party planning opportunities. Great events like sixteenth birthday celebrations, an 18th birthday and high school graduation call for a great party. Theme events are especially fun, because you can go wild with decorations and even costumes if you wish. They'll also make your party stand out from others. Our collection of teen party ideas will help you plan something great that will be cool, fun (and easy!). Don't know where to begin? A guide such as our teen party planner is a good first step to getting organized. Our favorite teen party ideas are easy themes that can work for large or small groups of guests. 1940's Party - Go back in time to World War II with this fun party full of USO shows and Uncle Sam. 1950's Party - take a step back in time to the wonderful 1950's! Whether having a party or a sock hop, you'll be "rockin' around the clock!" 1960's Party - Groovy! Celebrate the decade of the Beatles, Woodstock, and change. Around the World Party - pick your favorite countries and use food, decorations and games from those places! Awards Watching Party - Whether your favorite is the Oscars, Golden Globes, or MTV Awards...throw a party to watch the results! Backwards Party - Or should we say Party Backwards? Your guests will love this mixed-up party plan! Birthday Party Games - Plan to make a birthday special! Black and White Party - Always in fashion. Your turn to out-do Truman Capote's famous (infamous?) Black and White Ball. Black Light Party - One of the hottest teen party ideas themes at the moment! Great for a dance party! Camping Party - S'mores, sleeping bags and stars - combine them for a fun party! Candy Party - Willy Wonka, Candyland...let's celebrate all things sweet! Cartoon Party - Great fun to dress up - who is your favorite cartoon character? Classic Teen Party - Classic, time-proven ideas for a great party! Destination Party - A list of top destination teen party ideas. 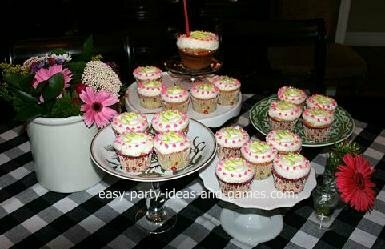 Teen Party Ideas for Guys - If you are planning a party just for the guys, you should visit this page for easy party ideas. Golden Birthday - Is this the year of your Golden Birthday? If so, use it as your theme or with your theme. Halloween Party Ideas for Teenagers - Your teenager Halloween headquarters! Hollywood Theme Party - Lots and lots of teen party ideas to make every guest feel like a star! Hotel Sleepovers - Not enough room for the sleepover of your dreams? Hotel Slumber Parties are becoming more and more popular. Luau Theme Party - Go tropical with our huge collection of luau and beach party ideas. Makeover Party What girl doesn't love a trip to the spa? Have a makeover party with your best girlfriends! Model Party - Have a passion for fashion? Have you got what it takes? Bring out your inner model at a Model Party! Music Star Party - Music stars, pop stars, rock stars. Whatever you want to call this party is fine. It all revolves around music and being the star. Mystery Party - Ideas for different kinds of mystery parties and specifically made for teen party ideas. New York Party - New York, New York, what a wonderful town...and a great party theme too! Very flexible - you can go in lots of different directions with this one. Night Under the Stars Party - a beautiful and fun theme, can be very elegant and popular for proms and other teen party ideas. Pirate Party - Arrr. Everyone loves a pirate! Great for co-ed parties and slumber parties too. You can even order online to get your own custom tattoos made! Pool Party - If you have a pool or have access to a pool, a pool party is always an easy party and holds lots of fun teen party ideas. Add some of our pool games to make your party really memorable! Purple Party - Celebrate all things purple at a Purple Party! Scavenger Hunts - Make this party into anything you want it to be! Lots of ideas to get you started. Scrapbooking Party - Have your guests bring some photographs, or even better...while planning the party take lots of photos of your friends and provide the photos for them to scrapbook. Give each guest a matching book to hold their scrapbook creations. Have plenty of tools and supplies available! Slumber Party - Make sure you visit our page devoted to having a teenage sleepover if this is part of your party plan for teen parties. 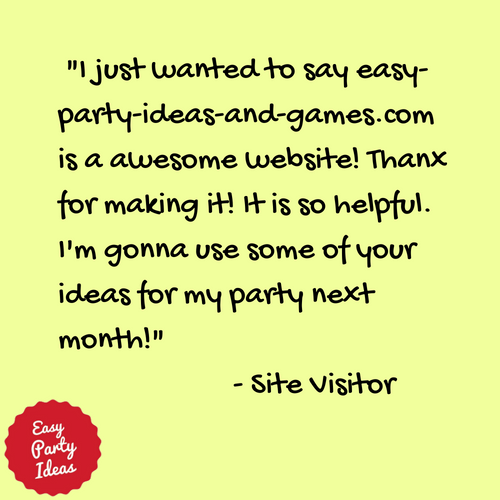 You'll find unlimited ideas for slumber parties! Sports Party - Siss Boom Rah! Celebrate your favorite team, the Olympics or sports in general. Sweet Sixteen Party - A list of ideas to make your sweet sixteen celebrations extra-special. Talent Show Party - Let your guests do the entertaining at this party! Treasure Adventure - Go on a treasure hunt...there are lots of challenging ones made just for teens. Western Party - Yee Haw! The old west is alive and well at this party. Winter Wonderland Party - a fun winter theme, also perfect for prom or 16th birthday party. Wizard of Oz Party - We're off to see the Wizard! You'll love going over the rainbow to have this Wizard of Oz party! Anime Party - Watch Anime Films, each sushi and learn some Japanese phrases. Have everyone wear an anime wig! Birthstone Party: Use the color of your birthstone as the theme for your invitations, decorations and favors. Game Show Party: Let's make a deal - Everyone draws a number, and three numbers are drawn to be "contestants". The three contestants come up one at a time. At each of their turns, the are told that they have won what is under the box one. They can then trade what is under box one (without knowing what it is) for what is inside a bag, written down on the piece of paper inside a balloon, behind a door, etc. Some prizes should be really good ones, and others...not so good. You can also play fun games such as Jeopardy, Name that Tune, Who Wants to be a Millionaire or set up your own games of the Price is Right! Helping Others Party: Find a way to make a difference with a charity party. First, contact the charity you are considering and find out if there are any requirements about your idea. For example, if you wish to assemble blankets for your local children's hospital, find out what types are needed, then make the blankets and deliver them! Jewelry Making Party: Supply everything needed to create necklaces, bracelets and/or earrings. Provide things to snack on and jewelry making books as examples (for inspiration!). Lock In: Part of the fun of a lock in is basically having a sleepover party with your friends in a different place. Sometimes in an amusement center, you can have one anywhere that has the space. Some fun ideas would be to have a scavenger hunt, card games, play flashlight tag, karaoke, video games, board games, radio controlled cars, movies - and lots of snacks and pizza! Manicure Party: Manicures, obviously! Either make arrangements to go to a salon for you and your guests. Often you can get a group rate. Or even better…go to the local beauty school for a great price. You can also do a manicure party at home, especially as part of a sleepover or slumber party. When doing this, have lots of color choices and all the tools available for a great job. Take turns doing each other’s nails while watching movies and having some good girl talk. For favors, give nail polish and/or tools to your guests. Mardi Gras Party: Teens can have fun doing really elaborate face painting, mask making and solving a murder mystery set in New Orleans. Pass out beads at a "humiliation table" - so to get beads you must do something from a list such as give someone a piggy back ride, wear a kick-me sign, propose marriage to someone, pretend to be superman. You can also do an internet scavenger hunt about New Orleans and eat King Cakes. Spa Party: Serve fresh salads and light finger foods. Wear your PJ's and treat your guests (or treat each other) to manicures, pedicures, facials and chair massages. Enjoy the luxury! Survivor Party: Decorate with homemade party decorations. Have each tribe create a tribe name, tribe chant and war dance. Give out tribal challenges that they must complete within a given amount of time. At decision time, give out awards to the team that has earned the most points. This is all about having a good time, so don't worry about voting someone off the island! Tailgate Party: For a sports fan, a tailgate birthday party can be just the ticket. Buy tickets to your favorite sporting event for you and your friends, and then "tailgate it'. Enjoy a cookout on the spot in the parking lot, or keep it simple and bring a pizza, soft drinks and a cookie cake. You don't have to make it a professional sporting event either. A high school game can be fun too. *Have lots of food to nibble on. Keep a table full of fun snacks available. *Music is very important. Select songs and CDs that your friends will enjoy listening to, even if it is just background music. *Plan activities. Crafts, music, movies...whatever you'd like. But have options available for the guests. Check out our list of teen party games. *Set some ground rules before the party. Talk about what is (and isn't) allowed in your home or the party facility. Make sure your teen knows that you want to make sure the event is safe (and fun too!). *Allow privacy. Nothing kills an event like a parent policing it. Be friendly, helpful and in the background. You can still keep tabs on what is going on without being in the middle of everything.